Carefully remove central stem from cabbage leaves. Fill medium- sized pot halfway with water and bring to a boil. 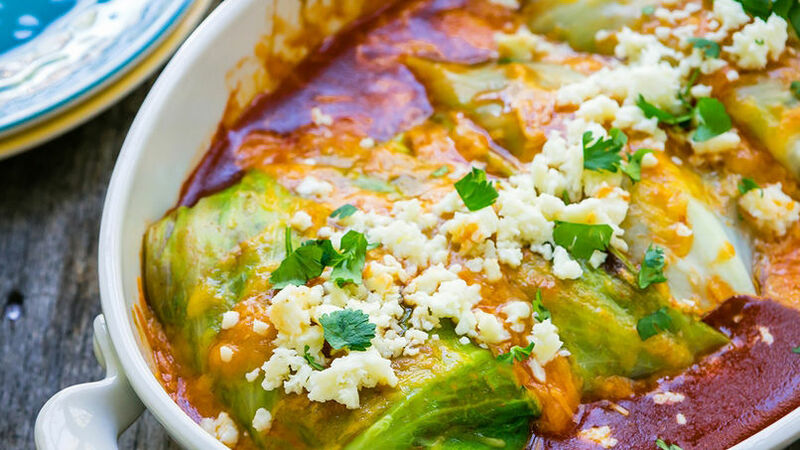 Add cabbage leaves and cook for 3-5 minutes or until the leaves are soft and can be shaped. Remove from water and drain. In a medium sized bowl combine quinoa, beans and 1 cup Cotija cheese. Put half of the enchilada sauce to an 8 x 8 baking dish. Add 1/3 of bean mixture to a cooked cabbage leaf. Roll up the leaves and fold the sides. Place in baking dish, folded side down. Repeat process with the remaining cabbage leaves. Top enchiladas with cheddar cheese. Bake for 20 minutes or until the cheese melts and bubbles. Remove from oven and let rest for 5 minutes. Top with remaining Cotija cheese and sprinkle with cilantro. Serve immediately. Season the filling with salt and pepper, to your liking. Keep in mind that Cotija cheese has a high sodium content and the enchilada sauce is fully seasoned. These vegetarian enchiladas will surprise you. The first time I made them was one day when my refrigerator was running low on supplies and there was practically nothing to make for dinner. I remember that I used what I had on hand and I was nervous about how it would all turn out. My creation was a total hit and my family loved it. Now I make this recipe very frequently since it’s perfect for those days when we don’t want to eat meat. You can prepare it ahead of time and bake it just before you’re ready to eat. Enjoy!